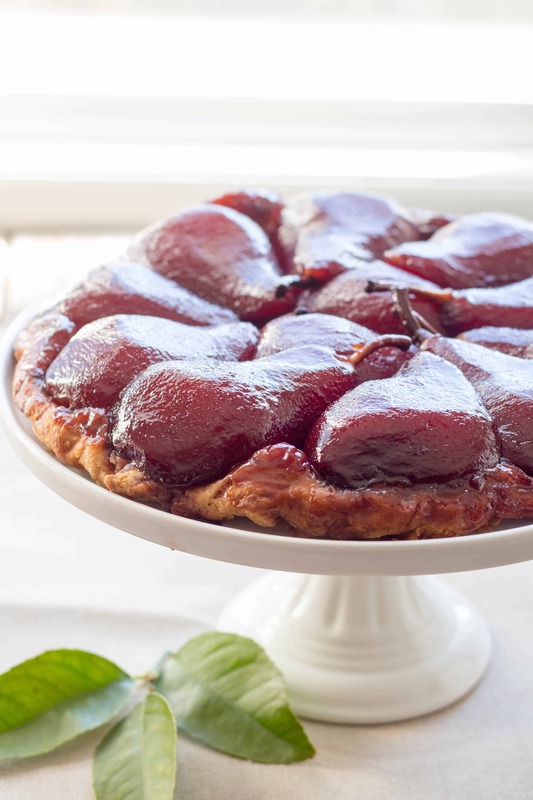 This show stopping French tarte tatin is made with tender pears that have been poached in a spice infused red wine sauce. Perfect for the holidays! 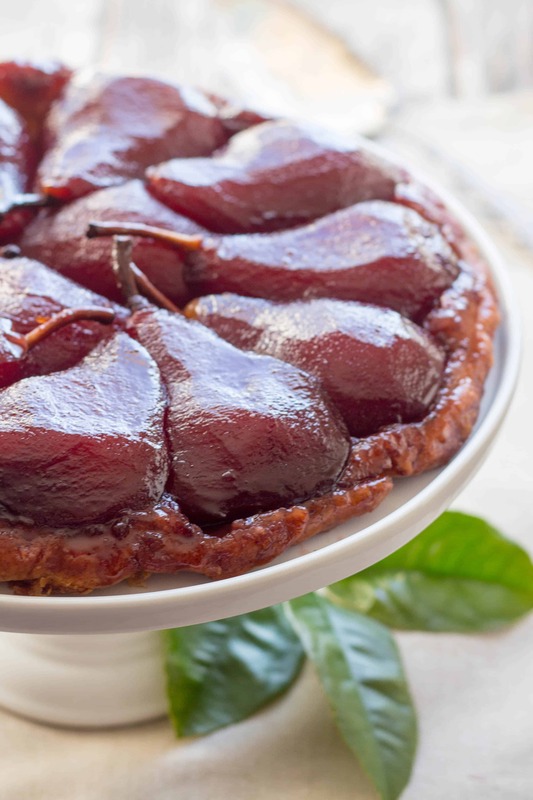 If this deep burgundy, wine-soaked, upside down pear tart doesn’t say “The Holidays,” well my friends, I just don’t know what does. 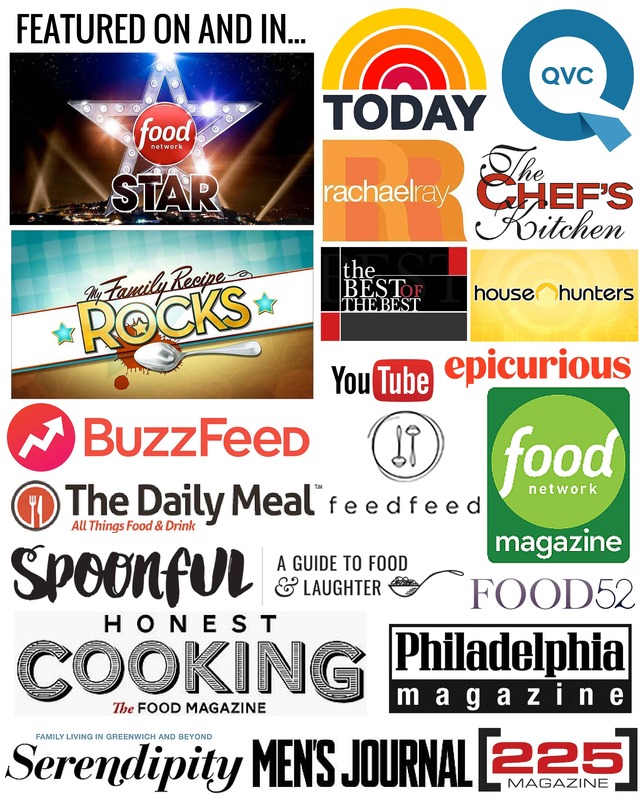 We do a lot of apple pie baking in our family – the traditional, very American kind. It’s our thing. Last fall, I wanted get out of my comfort zone and experiment with a French style apple pie called tarte tatin (pronounced tart tah-taahn). A tarte tatin is made by cooking halved or quartered apples in a rich caramel sauce on the stove top, then blanketing the top with pastry dough and baking until it’s puffed and golden. 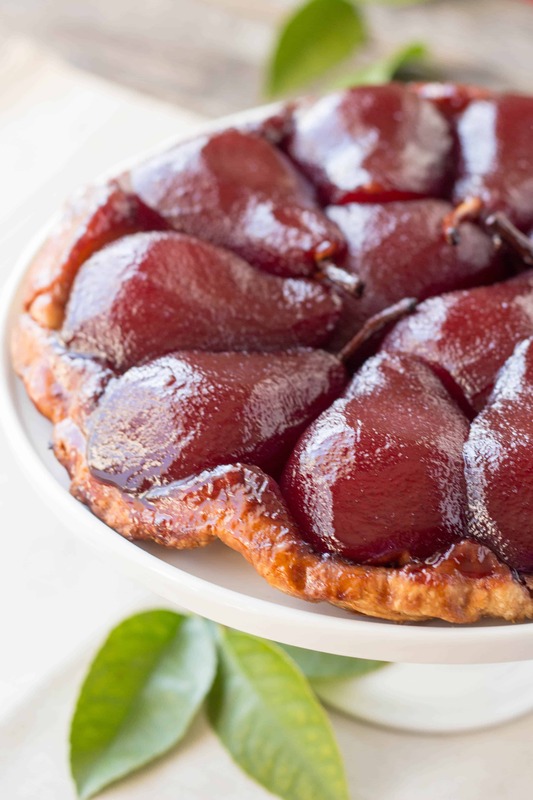 Once it cools slightly, the tarte is carefully inverted on to a platter, revealing the gorgeous pattern of gooey caramelized apples on top. My attempt wasn’t bad for a first try, as evidenced on my Instagram page. I used a few random apples that I had, and while some held their shape beautifully, all of the granny smiths disintegrated into mush, making for an odd looking tarte. But regardless of how it looked, it was absolutely delicious served with a big ol’ scoop of ice cream, and overall it was pretty painless to make. This year I wanted to take another stab at tarte tatin, only this time I set out to give it my own spin. 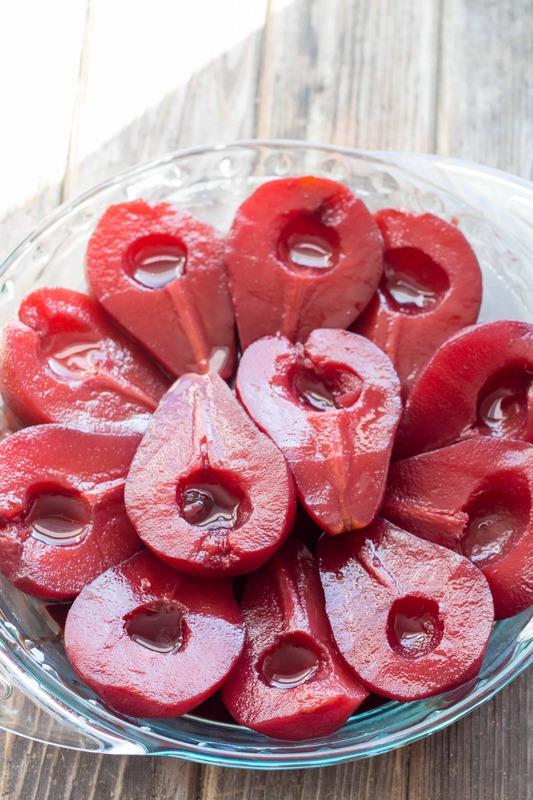 Around then, I was also thinking about making these gorgeous red wine poached pears that were once a signature winter dessert at the dinner parties I catered. Suddenly, a lightbulb went off in my head: The possibility of combining these two desserts was so very real, and at that moment I knew I had to make it happen. And by golly, it worked! It worked so well, in fact, that I’m already looking forward to making it again. I thought I was super original and clever for coming up with this idea, until I googled it and saw that David Lebovitz already thought of it last year. But it’s all g. He’s sort of a genius and amazing in every way, so I take it as a huge compliment that even for just a minute my brain thought a little bit like his. Now this tarte does take a bit of planning, but the overall labor isn’t too bad. The best part? It needs to be made (mostly) in advance, so it’s perfect to make for a party. 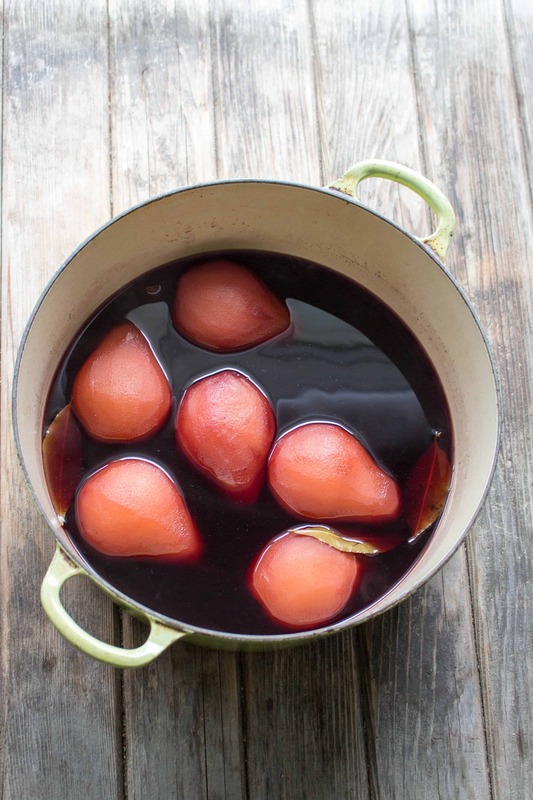 The pears first get poached in a rich, sweet red wine bath, then sit in the cooled liquid for several days to really soak up all the color and flavor. During this time you can make the pastry, as it also likes to hang out in the fridge for a few days. A classic French pate brisee is certainly the traditional choice, but I had a disc of my classic American style pie dough leftover from Thanksgiving so that’s what I used, and it worked out beautifully. When ready to assemble, the liquid gets reduced into a deep, thick syrup and poured into the bottom of a greased pie plate. The pears are then arranged in a pretty pattern, cut side-up. I left the stems on, because, well, that’s what David did and I just loved how rustic and beautiful they looked. You can choose to leave them in or cut them out… Just be sure your guests are aware that they are not, in fact, edible (you’d be surprised). The pastry dough gets rolled out, then draped over the fruit with the edges tucked in. The whole thing gets baked, and then inverted onto a platter. Now about that whole inverting onto a platter part… It can be a little tricky. 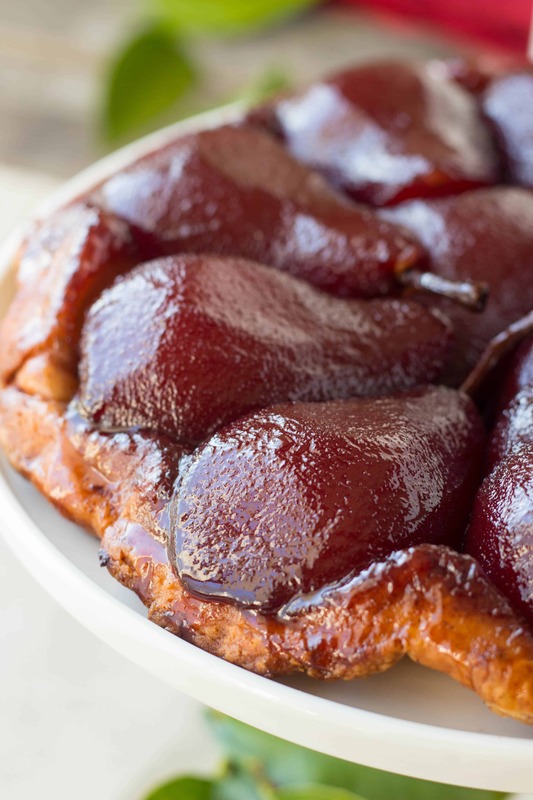 With a traditional tarte tatin, you need to find that sweet spot between being smoldering hot from the oven with very liquidy caramel, and totally cooled with too-thick caramel that sticks to the pan. I was nervous about the pears sticking, so I jumped the gun and inverted the tarte when the syrup was still way too liquidy. Turns out, the wine syrup doesn’t behave the same way a caramel does, and as a result, my kitchen (and even parts of the adjacent living room!) became doused with syrup. Sticky, wet, burgundy (really freaking sticky) syrup that I’m still discovering remnants of. Don’t be like me. Wait until it’s almost cooled completely. 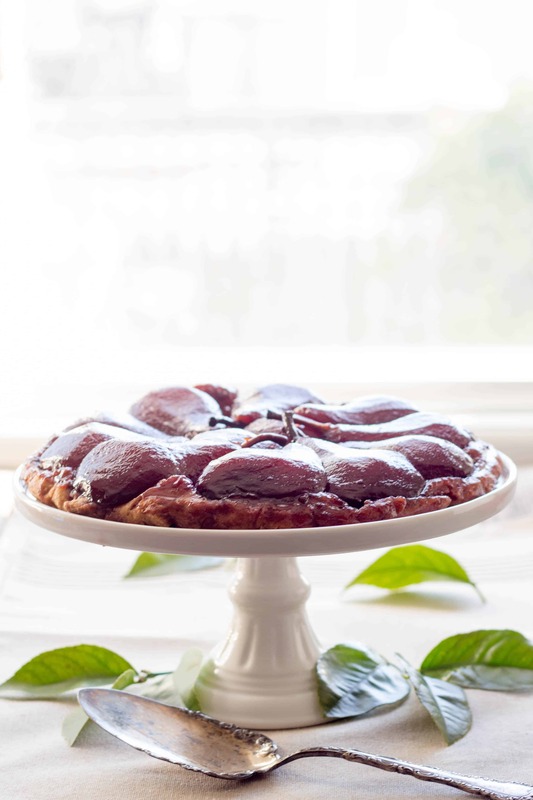 Served with vanilla ice cream, lightly sweetened whipped cream, mascarpone or even Greek yogurt, this red wine poached pear tarte tatin is seriously delicious, and one hell of a show stopper. Peel the pears, slice in half and use a melon baller to remove the cores, remove the stems or leave intact for a neat presentation. Pour the wine into a large saucepan, then fill the bottle with water and add that along with the sugar and bring up to a boil. Slice the vanilla bean in half lengthwise and use a knife to scrape out the seeds. Add the seeds and the pod to the mixture along with the cinnamon sticks and bay leaves. Reduce to a simmer, add the pears, and weigh them down with a plate so they’re all totally immersed. Poach for about 20 minutes, then remove from the pot and place in a container to prevent them from overcooking. Remove the cinnamon sticks, bay leaves and vanilla bean (save that vanilla bean for another use). Allow the liquid to cool completely, then pour over the pears, cover, and let sit in the refrigerator for 1-3 days. Combine the flour, salt and sugar in a medium bowl. Add the butter and shortening, then use a pastry cutter or fork to break down the fat until it becomes the size of peas. Pour in 3 tablespoons of water and mix gently with a rubber spatula or wooden spoon until the dough just starts to form a shaggy mass. Add more water one tablespoon at a time if needed. Use your hands to press the dough until it just comes together. Resist the urge to knead and squish – overmixing will make it tough. The dough should not be sticky, and you should be able to see the pieces of butter and shortening flecked throughout. Once the dough has formed, gently shape it into a disc. Wrap them in plastic and refrigerate for a minimum of 30 minutes or up to 3 days. For longer storage, wrap tightly and freeze for up to 6 months. Pour the pear liquid into a medium saucepan and bring up to a boil. Cook over medium-high heat until it has reduced by more than half, about 20 minutes. The liquid should be thick and syrupy. Keep a close eye on it towards the last few minutes of reduction. Overcooking the syrup will make it caramelize and give it an off flavor. Remove from the heat and whisk in the pinch of salt and butter. Set aside. Preheat the oven to 375 degrees. Butter the inside of a pie plate, then pour in 1/2 cup of the wine syrup. Arrange the pear halves in a pretty circular pattern with the cut side up (remember, this tart will be inverted so the bottom will eventually become the top). Be sure to cram them all in to fit – they’ll shrink a bit as they cook. Remove the dough from the refrigerator, unwrap and place on a generously floured work surface. Dust a rolling pin with flour, and begin to roll out the dough, rotating it 1 inch after every 1-2 rolls. This will help ensure the dough doesn’t stick to the counter, and will also keep it in a round shape. Use a measuring tape or the pie plate to determine when the dough has reached the right circumference. It should measure about 1 inche larger than the pie plate. If the dough does not roll out perfectly round, use a knife or a pizza cutter to trim the edges and even it out. Drape the dough over top and tuck the edges in between the pears and the edge of the dish. Bake in the oven for about 45 minutes to an hour, or until the dough on top is puffed and golden brown. Remove from the oven and allow to cool until only slightly warm. Place a serving plate over top of crust, hold down on it firmly with one hand while the other hand supports the bottom (it’s a good idea to wear oven mitts and long sleeves in case any of the syrup spills out). Hold the plates away from you, then quickly flip them both over so that the crust is now on the bottom. Gently remove the pie plate to reveal the pears. Drizzle with a little bit of leftover wine syrup (it’s strong and sweet – don’t go crazy)**. Serve warm (ideally) with vanilla ice cream, whipped cream or lightly sweetened mascarpone or Greek yogurt. *I prefer to use non hydrogenated shortening such as Spectrum Organic. **This recipe makes quite a bit of leftover wine syrup. It’s excellent served as an accompaniment with cheese or as a topping for ice cream! 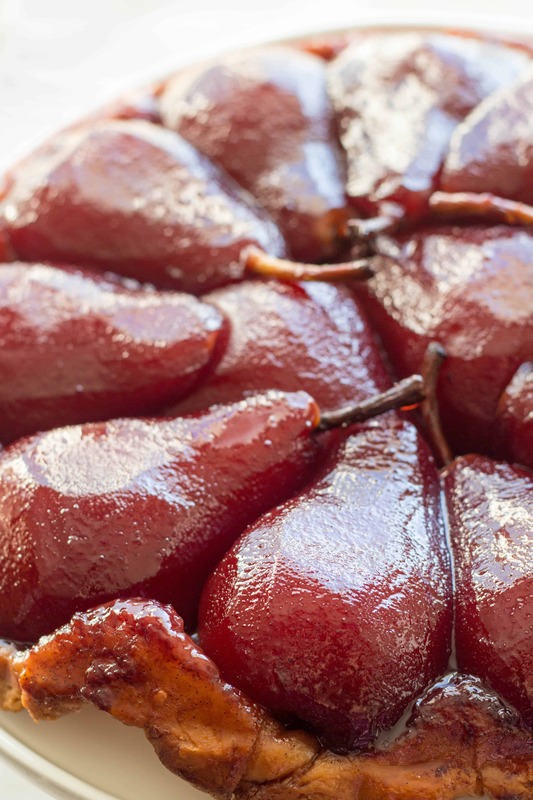 Those poached pears are gorgeous. That would get a standing ovation at my house. I’m a big fan of David Lebovitz, too. In my mind we’re friends who talk about ice cream and cookies.